Track users oppening each app. Google Analytics for Firebase is a free app measurement solution that provides insight on app usage and user engagement. At the heart of Firebase is Google Analytics for Firebase, a free and unlimited analytics solution. Analytics integrates across Firebase features. Simple: open Firebase Console and create a new project (or use an existing one). Why Firebase? 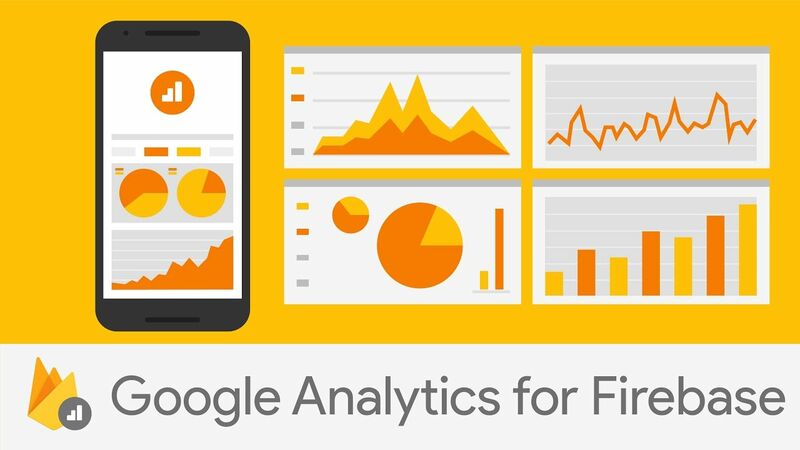 Google Analytics provide mobile app solutions across Firebase features. I created a simple Xamarin.Forms app using a TabbedPage and a Label. Of course, you can use your own project. We must implement the Firebase instance in each device, so this step is devided in two substeps. We are just going to track app opens. We are not going to use any DependencyInjection. We have our Xamarin.Forms project, and our Firebase project. Also we have an Android app. Let’s start creating the app instance in Firebase. If you are using a new Firebase project, just click on Add Firebase to your Android app. Otherwise, go to Project Overivew and click on Add another app. Add an Android app. Now we are going to follow Firebase steps. Complete with your app data. The package name can be found in AndroidManifest. The SHA-1 can be get following this guide. Download google-services.json. This file is going to be used to configure the Firebase tracking. 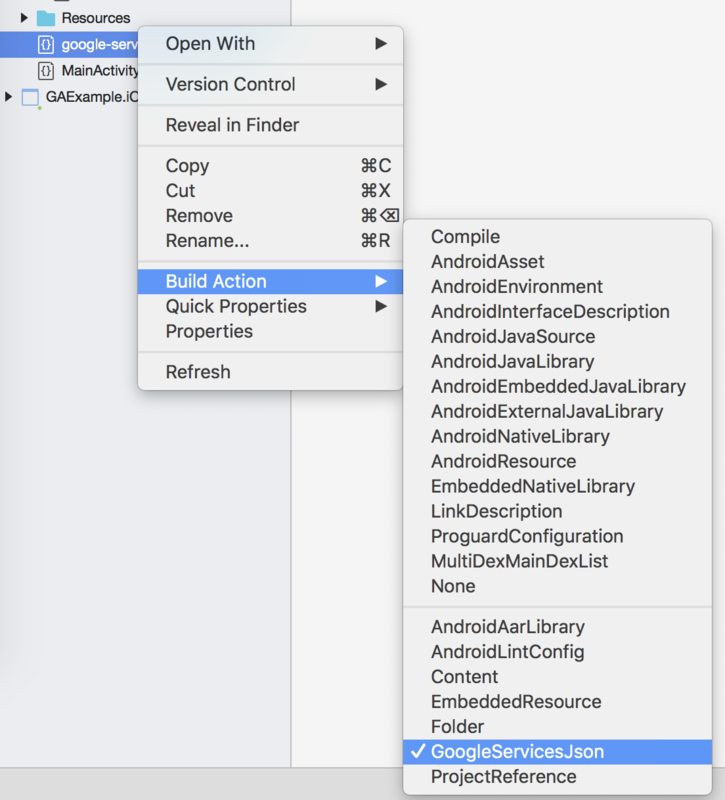 Add the configuration file to the Android project: move the file into the Xamarin project, in the Android app main folder. This file must be compiled as a GoogleServiseJson. Right click in the file (in Visual Studio) and open the Build Action menu. Right click in Android project and reveal in folder. Open Android .Android.csproj with any text editor. Add this to csproj Project tag. You can follow this reference. I created an issue in GooglePlayServicesComponents on Xamarin github. If you get the same error, please react and comment. Verify it’s working! Clean, rebuild and run! Complete with the app data. The bundle ID is found in Info.plist and the AppStore ID is found in Itunes Connect after creating the app. Download GoogleService-Info.plist. This will be the configuration file. Edit the .plist file (I use XCode, but any editor is OK), set IS_ANALYTICS_ENABLED property true. Copy the file in the main iOS project folder. Right click in the file and Set BuildAction to BundleResource. Add Xamarin.Firebase.iOS.Analytics Nuget Package. Some errors will appear, you must solve them adding an mtouch argument: --registrar:static in project options. To do this open project options (double clicking the project), add the argument, and click OK. Important: this must be done for each compiling configuration! We are logging an event because the package is not working anything without an event raising. I also reported an issue about this. Verify your app! Clean, rebuild, and run! Create an account (or choose an existing one). Click in + Create property. Connect to Firebase: select an app instance. Everything ready! The app is tracking! Open the recently created view in top left corner and whatch the dashboard. No! We are not taking advantage of Google Analytics at all… In the next tutorials I will explain how to get more and more information about our users!